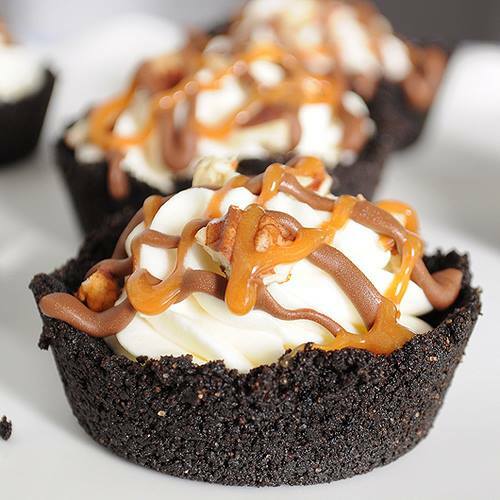 Cookie Crumbs Mousse Cups | Food, glorious food! This is one dessert recipe not only the kids, but you as well, will surely enjoy. The sweet combination of cookie crumbs, mousse, and nuts is simply appealing! Melt butter together with chocolate, and add it to the cookie crumbs. Mix them well with a fork. Firmly press the crumb mixture into the cups of your muffin tin. Make sure the bottom has about 1/4 inch thickness to avoid it from crumbling easily later on. While you are chilling your cookie crumbs, make the caramel syrup by mixing the sugar water in a saucepan. Put it on high heat to cook until you achieve the colour of amber. Then cover the saucepan with tin foil with a smal hole in the middle. Pour the 1 cup of water through that hole. When the syrup stops exploding, reduce heat to medium and give it a whisk until you have a good and even consistency. Set it aside and allow to cool. Whip vanilla extract and heavy cream until the cream holds soft peaks. Fold the caramel syrup into the whipped cream gently, until evenly combined. You can chop the pecans while waiting. Once everything is done and good, start off by gently removing the crust in the cups. You might need to run a little hot water at the bottom of the cups and tap it to make it easier to get without destroying the form. Pipe the mousse nicely in the cups of crumbs. Top with pecans, drizzle with melted chocolate or caramels, or caramel sauce.